Anyone know of anything else new going on in Greenville as far as growth? Here are some things I have been watching. ICAR seems to be coming along fine. Supposed to bring 20000 jobs to Greenville. Its right at the end of the motor mile for those familiar. Greenville's third largest shopping center is under constuction on Woodruff Road. Construction continues on I-385 to widen it. Don't really know what the hell is going on on I-85, but there are always lanes being closed and pavement work going on between the Laurens Rd exit and Pelham Rd exit. Greenville Mall was bought by another company. Not sure of plans there. Haywood Mall is just Haywood as always. Best mall in Greenville. Liberty Bridge in Falls Park downtown is complete and beautiful, the whole park is relaxing. River Place is going up opposite the park. Sticky Fingers opened a large restaurant on main st. Making it the 2nd Sticky Fingers in Greenville. The other is on Woodruff Rd. I could go on and on. Anyone want to add something? ICAR is one of those places that will bring jobs not just to Greenville, but the entire Upstate, much like BMW has done. The work on 85 seems to me to just be a general resurfacing, but it is in conjunction with the 385 widening. What is this new whopping center on Woodruff Rd? What are the first a second largest centers? Along with those you mentioned are the several apartments/condos going up downtown. ICAR is definately the biggest news around Greenville. Don't forget that new Reseach Campus that Greenville Memorial is going to get. The city is considering puitting in a trolley, but that is in the early stages and may not be implemented. Thats all I can think of rigiht now, but I'm sure there are more. Haywood mall is the Largest shopping center in Greenville. Not sure whats second. Article I read said the one on Woodruff would be the 3rd largest. You are right about ICAR having a regional affect. Condos and apartments going up everywhere downtown like you said. Forgot about Greenville Memorial. All this and still no new skyscraper. So moton, or spartan do either one of you have any pics of the bridge over the falls downtown? Spartan, I am sure they are considering everything. Even shopping centers like Dorman Center, Cherrydale Point, and the regular malls. The Shops at Greenridge is what this new one is called. Liberty Bridge and the whole park is like nothing I have ever seen. Has become a tourist attraction already! I see people from out of state shooting pictures of it and the whole downtown area. Ran into some folks from Pennsylvania today that were shooting pictures. Pics of the bridge are available at greenvillonline.com . If I have time I will copy and post some. Unfortunately the only one I have is during the flood this summer- it was uncompleted at this point. I can't wait til this in finished! This is the Riverplace development downtown. Go to www.55riverplace.com for more info. Notice that the white building is the same one that is to the left of the amphitheater in the first image, and the building to the far left in the upper part of the second image. Riverplace is being built on the left side of this pic. It was taken around 1990. Wow! That white building is part of a restaurant below the Peace Center now. It is used for outside dining by the river. The whole area looks a lot better now and is very appealing to the eye. Didn't realize how far downtown has come, being I am originally from Greenwood. There is a pedestrian bridge where those tracks were now. I cross it a lot. Looks like the river has been cleaned up and widened. Looks a lot better than whats in that old picture. Greenville is on the map for sure. It is very safe downtown now too. There are cameras everywhere! Even in places you think there aren't! I have seen the bubble kind in the park, behind the Peace Center, and pretty much everywhere downtown. Can be creepy at times though when you catch one looking at you and moving with you. Have to look hard to see in them, but you can see them move. Those renderigs around the park look reall nice. When will the entire thing be finished? Phase I is supposed to be finished in 2005. With constuction continuing until 2010. 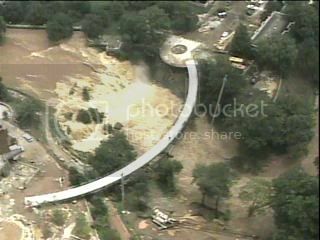 There is a pedestrian bridge where those tracks were now. I cross it a lot. Looks like the river has been cleaned up and widened. Looks a lot better than whats in that old picture. That is a great project for Greenville! But, what happens if the river floods? It is so close to the river and there is no wall to stop it from encroaching up the riverbank. You are right. That was an incredible flood. looks a lot like milton, delaware. or milford i forget.